Anyone can, at some point, be faced with a conflict. Dealing ineffectively with conflicts may threaten your relationships. Examples of ways of dealing with conflicts which usually do not work well are: expressing negative emotions, being hostile, seeking revenge, and making accusations. It is usually more effective to control your emotions, be forgiving, accepting personal blame, and looking at the situation from a distance. But in the heat of the moment it can be hard to come up with an effective way of responding to conflicts. A new publication identifies an effective way of responding. Huyn et al. 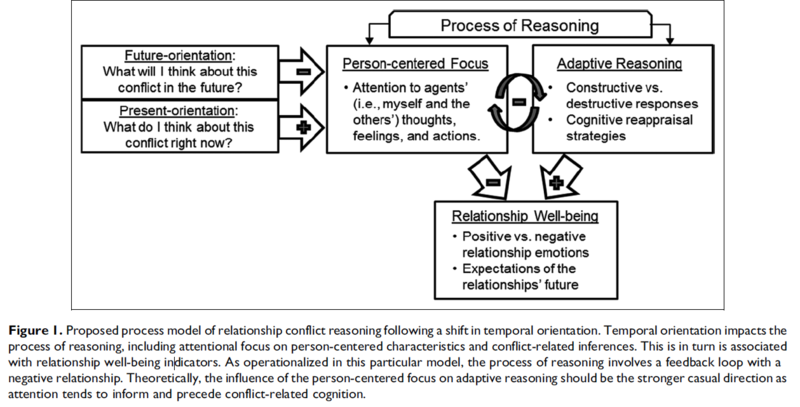 (2016) examined how taking a future-oriented perspective, by asking yourself what you might think about the conflict in the future, can help in solving the conflict. Their hypothesis was that adopting a future-orientation gives one a broader perspective on the situation. This may help to divert attention away from personal feelings and behaviors in the here-and-now which may make it easier to be non-defensive and non-accusatory and more forgiving (and thus more effective). The figure below shows their proposed model. In two experiments (1 with students, 2 with older adults) they had participants reflect on a conflict they had had with their romantic partner. Participants were either asked to describe their present thoughts while looking back on the conflict (present-orientation) or to describe what their thoughts about the conflict one year from now would be about the conflict (future-orientation). In both experiments participants in the future-orientation condition focused less on personal feelings and behaviors which helped them to reason more adaptively (be more forgiving, have more insight) which, in turn, helped them to feel better about the relationship (more positive emotions and being more hopeful that the relationship would last). The figure below shows these findings. Huyn et al. 's model was confirmed. It seems wise to ask yourself, when in a conflict situation, the following question: what will my thoughts about this conflict be, one year from now?